A while back, the Wall Street Journal ran a story about Amazon being in talks with major banks, including JP Morgan, about building what the Journal referred to as a “checking-account-like” product. This set off a storm of speculation about Amazon moving into the banking business, despite the obvious fact that you don’t need to be a bank to offer such a product. One of the main reasons for the speculation growing was that consumers seem warm to the idea. Almost half of US consumers surveyed said that were “open” to the idea of Amazon as the provider of their primary bank account (according to LendEDU) which may seem surprising but I think is a reflection on consumer experiences of Amazon in practice. Yesterday I ordered some bottles of sparkling water and some bottles of Coke from Amazon, this morning they showed up. From the time I hit the “buy” button on Amazon I never gave the transactions a moment’s thought. It just works. Some commentators therefore began talking about Amazon becoming a bank. Any why not? They’ve become a book shop! 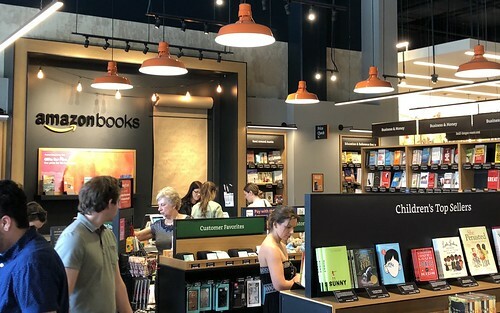 I went into the Amazon store in Austin, Texas, just to buy a physical book from them because I could! I don’t think they will, though. Why don’t I think Amazon will be a bank? Because, as was said in The Street, “I don’t think Amazon wants to be a bank in the way that JPMorgan is a bank”. Amazon just does not make money the way that banks make money. Look at their existing partnership with Bank of America to lend money to merchants. Amazon don’t care about making some small margin from interest payments, they care about helping merchants to increase Amazon’s overall sales. If Amazon is going to distribute financial services but not be a bank, then what will it be? I think it’s time for another review of terminology and I’ve got a couple of suggestions. Let’s standardise this way: a “neo-bank” is something that looks like bank, but isn’t (eg, my Simple account when I first got it and before they were taken over by BBVA, which is an actual bank), whereas a “near-bank” is something that performs a function traditionally associated with banks but isn’t a bank and doesn’t look like a bank (eg, Transferwise). In this framework, Amazon would probably become a Neo-bank. The neo-bank is not a new idea, by the way. In 1997, I wrote, with Consult Hyperion colleague Mike Young, an article for Internet Research (Volume 7, Number 2, p.120-128) called “Financial Services and the Internet”. In that article we wrote about the potential for the new technology to assemble a banking service depending on the customers’ needs explaining how the new infrastructure would allow customers to build their own financial services “with the underlying best-of-breed products originating from a wide range of suppliers” which the manufacturers of financial services (eg, banks) would “retreat to a small range of products that build on core competencies, but supplied to a global market”. Amazon is precisely the kind of organisation that can take these products (eg, unsecured personal credit) to that market. If Amazon were to provide something that looks like a checking account but is actually a prepaid account of some kind (as my Simple account was), would people use it? I think the answer to this is a resounding yes, especially if Amazon offer the usual array of discounts or cashback to go with it. They have plenty of margin to trade for data. Look at their credit card that gives you 5% back at Whole Foods, for example. If Starbucks can sit on a a billion (plus) in float just from people buying coffee, imagine the float that Amazon could sit on from people buying… well, everything. If people begin holding $$$ in Amazon float that gives them a 2% discount on stuff instead of holding $$$ in a bank account that gives them a 0.2% interest rate, funds will begin to drain away from demand deposits pretty damn quickly. Now imagine how quickly that might happen in Europe, where Amazon can use PSD2 to get direct access to customer bank accounts in order to instruct credit transfers to load to Amazon accounts automatically, something like their US Amazon Cash service but using modern electronic instant payments transistors and laser beams instead of Federal Reserve bills. It could be seriously big business.